Juneau has a reputation as the USA's prettiest capital. Despite almost herculean efforts on the part of city planners and developers to camouflage it's charm with uninspiring modern architecture, the beauty of the city's natural surroundings manages to shine through. With just 32,000 people, Juneau is small enough to see in a couple of days. Downtown is characterised by wall-to-wall souvenir shops and jewellery stores. Sadly, we were told, few of these are locally owned, with many being run by the same cruise ship multi-nationals which deliver thousands of eager tourists through their doors every day throughout the summer. Cruise ships and uninspiring architecture define the downtown area. Parking in downtown Juneau is a nightmare. On our first day there a very helpful parking officer gave us directions to a small parking lot on Nth Franklin Street where we got the very last vacant spot on the entire continent. Even walking is a challenge. Near where the cruise ships berth, the city employs a small army of lollipop ladies (and guys) to police the pedestrian crossings in an effort to keep pedestrians and cars apart. With tourists constantly stopping, changing direction and spilling off the footpaths on to the road, the system is only marginally better than total chaos. In Sydney we have a saying, 'Like Pitt Street on a Saturday morning' - think Pitt Street and multiply it by a hundred. However don't let the crowds put you off Juneau entirely. There is a lot to see and most of it is pleasantly crowd free. 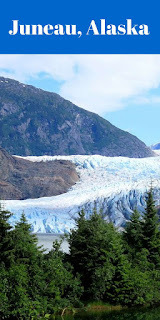 Just outside of town you will find the magnificent Mendenhall Glacier. It is so accessible that you can see it without leaving your car or better yet an easy fifteen minute walk along the Nugget Falls Trail brings you so close to the glacier's foot that you can feel the suddenly plumetting air temperature. The glacier empties into a glistening blue lake dotted with mini-icebergs. If you are feeling energetic follow the East Glacier Trail for views from above. Make sure you return to the carpark via the Steep Creek Trail. We discovered a porcupine, or he discovered us, right next to the trail and on a second visit we followed a deer along for several minutes. Never having seen a porcupine before we had to use google to discover what sort of animal he was. At first we thought he was a beaver. Click here for a map of the trails. Don't laugh but we had to use google to find out what sort of animal this was. At first we thought he was a beaver. Cute isn't he! This little guy shared the trail with us for a while. Whether you cruise to it, go by boat tour or fly over it, whatever you do do not miss Glacier Bay National Park. This is the jewel in the crown of South East Alaska. I am not even going to try to describe the magic of Glacier Bay. I will just let my camera do the talking. Close up on a glacier from above. We were lucky enough to see this glacier calve. Note: The closest jumping off point to Glacier Bay National Park seems to be Gustavus but Gustavus is itself remote and not accessible by road. The Shrine of St Therese. Dedicated to Saint Therese of Lisieux, the patron saint of Alaska, the Shrine of St Therese is 22 miles north of Juneau. With it's little Chapel set in the woods the Shrine makes for a lovely afternoon's excursion. As an added benefit the road to and beyond the Shrine is a great place for animal spotting. We saw a large black bear not far past the Shrine's turn-off and at the Shrine itself there was a whale, several bald eagles and a very cute ginger cat who walked with us for about half a mile (D, a cat person, says I have to put the bit about the cat in). The whale was a long way out but as we stood looking across the Gastineau Channel an eagle swooped down in front of us, caught a fish in it's claws and flew off. It was over within seconds, far too quickly for me to take a photo, but it was a once in a lifetime moment. Neither the eagle, the whale nor the bear stuck around to be photographed but this guy did. And so did this little guy - pretty sure he's a marmot. Juneau, the capital of Alaska is situated on the coast of the Alaskan panhandle. 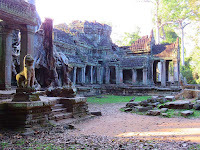 Although it is on the mainland it is not accessible by road. It has a population of 32,000. The Tracy Arm Fjord - We did not see Tracy Arm while we were in Juneau, however judging by the photos I have seen it is well worth a visit. For something a little more low key take a walk along the shores of Auke Lake. The lake is 10 miles north-east of Juneau. Look across the lake and you'll see float planes parked in front of houses in the same way people in other places park cars. Drive past the Governor's Mansion and see where Sarah Palin once lived. Do Australians pay more than Americans for Alaskan Cruises? The Alaska Marine Highway- Alaska by car ferry. The Alaska Marine Highway - a close call with catastrophe. The Alaska Marine Highway - Ketchikan, Wrangell, Petersburg and the Wrangell Narrows. The Alaska Marine Highway - Juneau to Sitka by car ferry. Wow! Spectacular scenery. I know several family and friends who have visited Juneau while on cruise ships....but this is the first post I've read where someone has visited independently. Very interesting. Very few Australians have heard of the Alaska Marine Highway. It's a pity because it gave us a lot more flexibility than going on a cruise. We were able to build our own itinerary. After leaving Juneau we took the car ferry to Sitka for a few days and then joined the mainland at Haines. From Haines we were able to drive back toward Seattle along the Alaska Highway. We are still in Canada and I have quite a few catch-up posts to do. All the scenery is impressive, especially Glacier Bay. It must have been wonderful to see so much wildlife on your trip, even if some of them (e.g. black bear) are better kept at a distance. We were in the car when we saw the bear which is definitely the way I want to see bears- lol. Extraordinary pictures, Lyn. You captured the majesty of this glacier so well. I'm planning to go to Alaska in August, so thank for this post. If you are going on a cruise you will probably cruise to Glacier Bay, if not try to see it somehow. We flew over it in a small plane which was just fantastic but there are other ways to see it as well. p.s I know you write a blog. I am pretty sure I have read and commented on posts you have written but I have lost the address of your web page. Would you mind putting the address up for me so I can pop across and see your latest posts - Thanks. We did Alaska by ferry and I can vouch for Tracy Arm - it's spectacular. Beautiful blue icebergs and caribbean like turquoise water. Our itineraries seem similiar - we did Juneau, Haines, Skagway and Sitka. Now I would like to return and go to Denali and the Kenai Peninsula. Sounds fabulous. One thing I found quite difficult when we were planning was working out where Tracy Arm and Glacier Bay were in relation to where we were going. It is almost as if there was an expectation that you would know where they were when looking at tour options. I loved the glaciers. They were the highlight of Alaska for me. Juneau was a cruise port for us, and one without enough time. I went whale watching and then to Mendenhall Glacier, while hubby and our other daughter went kayaking to the glacier. Kayaking to the glacier sounds like a lot of fun. We talked to one of the workers at our hotel who said she and friends sometimes did it at night - it doesn't get very dark in summer. She described kayaking around the icebergs at 3 a.m. in the morning. It sounded magical. I remember when we landed in Anchorage at midnight and it was still light out. How fun would it be to kayak at 3am to the glacier. It is on my bucket list for next time. Although to be honest I found the long hours of daylight a bit of a two-edged sword. I'm one of those people who just can't function on less than 8 hours sleep so the whole midnight sun thing just kept me awake when I should have been asleep - lol. Cruises are such a common and well, easy, way to see Alaska. But your car trip does give us other ideas. Wow, what scenery! We were originally going to take a cruise but when we found out about the Alaska Marine Highway there was no contest. It was such an adventure. I have never seen such beautiful photos of glaciers like this, fabulous photography!!! Thanks. The scenery was so stunning it wasn't hard to take great photos. Loved seeing your pictures but saddened to hear about the over-reaching commercialization of downtown. I lived in Juneau in the 1970's and it was an incredible place - sophisticated (State Gov. brought in lots of energy) with a teeming and supportive arts scene, restaurants... That was before the Exon Valdez shifted so much and the cruise lines took over in a scramble for tourist dollars (my two cent theory.) Still it looks beautiful and indeed, that was a Marmot. Perhaps the energy is still there. It is hard to know from a couple of days as a tourist. I imagine the locals avoid the jewelery shops and have their own favourite places the tourists never find out about. I like how your Mendenhall Glacier article also had some critter photos. Looks like a great place. I love seeing animals in the wild. It is always fun. Thanks. I am pretty pleased with how the photos turned out. wonderful series. love the mendenhall glacier. Thank you. The Mendenhall glacier was stunning. Beautiful images from your Alaska trip! I have a similar shot of the Mendenhall Glacier. I love the cute porcupine and deer. Thanks for sharing your trip, have a happy week! You get so close to the glacier that it makes it really easy to take good photos. It was fantastic flying over the icefield. Spectacular views of the glacier! The flight was a fabulous experience. I never imagined Janeau to be a modern city - I think because of its isolation I expected it to have got lost in time, a fun place to explore before setting off on the real journey. 'Lost in time' - what a romantic idea but no Juneau is as modern as anywhere. Except perhaps for their parking payment system, which was antiquated when Noah was a boy. It worked though. The majesty of glaciers absolutely fascinate me - you got some beautiful photos of these. And wow - a real life porcupine, that is awesome! Thanks for joining in #wednesdaywanderlust again this week, so great to have you there. I am really happy with my glacier photos and never having seen a porcupine before that was a treat. I have never seen a glacier but I imagine it is one of those experiences that leave you breathless. Your photos looks amazing. Did you guys took a flying tour to see Glacier Bay? Yes. We flew over Glacier Bay in a light plane - it was fantastic. Actually we had a heat wave for most of the time we were in Alaska - it was weird. Alaska has been creeping its way up my MUST VISIT list after seeing so many amazing stories from people from their visits there! It seems like an amazing place! I hope you get there one day and enjoy it as much as we did. Thank you. I am very pleased with the way they came out. Absolutely gorgeous! haha it's too cute you have never seen a porcupine - as a Canadian it seems so obvious and yet when I go to other countries and ask what their animals are everyone seems to think I'm weird for not knowing! I know what you mean. When we saw our first marmot I thought it was a beaver. I think every small furry animal is a beaver but I don't think I have ever actually seen one. I always thought porcupines were similar to our echidnas and that I would recognize one easily but now I realise echidnas are much smaller and quite different. I've earmarked the Alaska cruises as the only way I'll ever get my husband to take a cruise, but your way seems better for getting away from the tourist hordes when we want.... He'll love the scenery (great pictures, by the way) and I'll love the history of places like Skagway. Your husband must be like mine - he sooooo didn't want to take a cruise. It is still very hard to get away from the cruise crowds and the effect they have had on the small towns they visit. Skagway is like Ketchikan. We enjoyed it but in summer it is permanently swamped by cruise ships. One piece of advice - the Alaska Marine Highway, unlike the cruise ships, does not go to Glacier Bay National Park which is where the glaciers calve regularly and you see the huge icefields so you need to research another way of seeing it or seeing another icefield. We flew over it in a light plane. I am going to Juneau next month by cruise ship so I won't be parking or driving, but will be avoiding cars and watching for the lollypop ladies! I am even more excited to visit now that I read your informative article. Awesome photos too! I hope you have a wonderful time. Don't expect the views to be spectacular from the moment you board the ship. Assuming you travel north from the U.S or Vancouver you will start by seeing lots and lots of pine trees but as you get close to Juneau the glaciers start to come into view. My husband and I celebrated an anniversary with a helicopter ride to and landing on Mendenhall Glacier in Juneau. Such a beautiful and magnificent spot! Maybe you'd like to submit your kitty photo to my traveling cats photo gallery?, e- me at editor (at) berkeleyandbeyond (dot) com. Thanks. I'll send the cat photo in the next few days. Juneau is a great visit, if you can avoid the cruise ships! Having a car helps. If you are on foot I don't think you can avoid them. Guilty. I visited Juneau on a cruise ship, but it was one of our best days. I was with a family group of 10, ranging in age from 13 to 90. We all did our own thing. I went for a great small group hike next to the Mendenhall Glacier. One person got tired and wanted to sit down and wait for us to return, but our guide said there were too many bears around and she had to stay with us. This guide also told us that most of the inhabitants of Juneau rely on anti-depressants during the winter. I don't think he was exactly joking. On the same day, my husband took a helicopter ride to go dog sled mushing on a glacier. Our sons and their aunts went white water rafting and the over 75 contingent went on a bus tour. Love your photos. We even got some good ones---even though we were cruise ship people. The key is not to hang around the tourist shops. Sounds like you had a fantastic time. We also did a hike at the Mendenhall Glacier which we really enjoyed. I don't really have anything against cruising although the fact that Australians have to pay more than North Americans for the same cruises annoys me a lot. We were originally going to go by cruise ship and that was the thing that stopped us. Most Australians have never heard of the Alaska Marine Highway though and I just want to get the word out that there is an alternative.